If you are a victim of domestic violence or domestic abuse, there are powerful legal tools to help you obtain the protection you need. If a restraining order or domestic violence injunction has been entered against you, there are legal procedures in place to protect your rights. If you are looking for experienced, trusted counsel in Jacksonville, FL, the highly rated domestic violence attorney Summer Nichols will provide experienced legal help in any domestic violence-related legal matter. Do you feel that you or your children are in danger from your partner, spouse or former spouse? Have you been accused of domestic violence and have questions regarding your legal rights? Call (904) 322-7702 or email our office to schedule a free initial consultation. 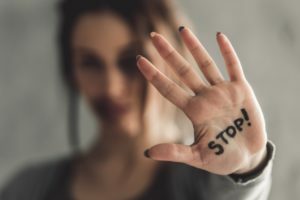 Our Jacksonville domestic violence attorney team can file a petition for a domestic violence injunction (restraining order) to protect you and your family. An injunction can provide you with immediate exclusive use of your home, allowing the offender to return to your home only when escorted by a police officer and only to recover personal belongings. After the temporary injunction is in place, we will represent you at a permanent restraining order hearing that is usually scheduled 15 days following the date the initial order was entered. Contact the Jacksonville domestic violence attorneys at the law firm of Summer Nichols Law Firm if you have questions regarding domestic violence. We provide a free initial consultation, accept MasterCard, Visa, Discover and American Express, and charge reasonable and competitive rates. Contact us by calling (904) 322-7702 or by filling the free case evaluation form. We will respond at our earliest opportunity! Domestic Violence is a serious issue that needs to be resolved through the Court if you feel you are in imminent danger based on previous physical violence, threats, or stalking. You can be granted an Injunction for Protection Against Domestic Violence (more commonly known as a restraining order) if you an convince the court that your fear of the violent person is reasonable. Your local county courthouse has a department where you can file for an Injunction for Protection. Once you file, your written request will be reviewed by a judge and, if there are grounds, the judge will grant you a temporary injunction or a period of two weeks. This temporary injunction will be served by the sheriff’s office on the other party and a court hearing will be scheduled exactly two weeks from the date you filed, where you will be given an opportunity to testify in person before the Court regarding your allegations and why you feel an injunction is necessary. The other party will be give an opportunity at that Court hearing to either agree to the injunction or defend his or her self. The Law Office of Summer R. Nichols is extremely experienced in these types of hearings, the testimony that is needed, and the evidence or witnesses that will be permitted to assist you with making your case. Contact us today for a free consultation to discuss getting you relief from violence and fear of violence! The Law Office of Summer R. Nichols has over a decade of experience with injunction law. Contact us today for your FREE consultation.